Trip Log – Day 71 – Denver, CO | How Will We Live Tomorrow? Let’s all get along on the road. In the four years since my last cycle tour, people have become much more considerate of cyclists. However, we suffer from being in a hybrid world, neither pedestrian nor motor vehicle. We rarely have our own space. The cars want us on the sidewalks; the pedestrians want us on the shoulder. Most everyone wants us in the gutter. Five things I have observed after 4000 miles that cyclists and the rest of the world can do to make cycling even better for everyone. 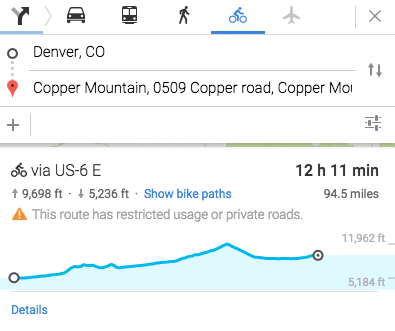 Dear Google: I love your bicycle route maps. They give me options, they give me estimated time, they give me vertical rise and fall. What they don’t tell me is whether the suggested roads are paved or not. I think you do that for cars – could you do that for bikes as well? Whether a road is paved makes a big difference in determining a route. Dear highway engineers: Bike lanes marked on the road pavement are saver than bike paths set back from the street. This seems counterintuitive, but when I’m on the pavement, cars see me. When I’m set apart by a curb and grass strip, drivers aren’t looking for me at cross streets. My only mishap to date happened when cars at right angles were unaware of me coming off a bike path set back from the road. Dear people who consider bike paths routes for ten-year-olds to get to a ball game: Take the silly curves out of bake paths. Let us get from Point A to Point B with the same clarify that other vehicles use. If I want to zig-zag my path, I’ll play Candyland. Dear vehicle drivers: If a cyclist is riding along the shoulder and following the rules of the road – don’t honk! I don’t know if you are perturbed that I exist or are jealous that you’re stuck in your car while I’m in the open air. Either way, being honked at is unnerving. Dear cyclists. Follow the rules of the road. I know we are independent-minded souls who hate being regimented, but we have to stop at red lights, signal, etc. Okay, okay, if no one’s around roll through the stop sign, but don’t make vehicles nervous about whether we’re going to stop, go, or head off in an unexpected direction. We chose to cycle, so enjoy the journey and accept we can’t get everywhere as fast as possible. This entry was posted in Bicycle Trip Log and tagged bicycling, bike paths, cycling, google bike routes. Bookmark the permalink.